Now that sriracha has reached ketchup-level ubiquity -- perhaps to a fault -- it's high time for a new condiment to step up to the plate (sorry, we had to) and fight for a spot in every American's over-crowded fridge door. Heinz, the preeminent purveyor of ketchup and other classic condiments, thinks it's found just the thing in a new partnership with celebrity Chef David Chang's Momofuku food empire: Ssäm Sauce. This week, Kraft Heinz and Momofuku announced the spicy, umami-rich Korean chili sauce -- a longtime staple at Momofuku restaurants -- is now available nationwide for the first time. Although it's not about to replace your go-to sauces and dips entirely, they say Ssäm Sauce, which combines miso, sake, soy sauce, rice vinegar and a traditional Korean chili paste called Gochujang, is "good on everything." When Chang first started bottling the stuff for purchase exclusively via Momofuku back in 2015, he claimed it improves foods such as fried chicken, pizza, burgers, noodles, and pork buns -- going so far as to say "it even makes sriracha better." The claim is a big one, but it's held up since. 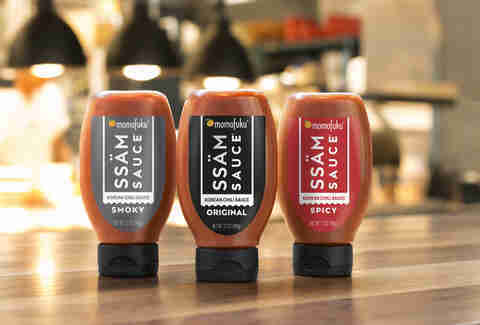 In addition to making the original Ssäm Sauce available nationwide via Amazon.com, the companies have also teamed up to launch two all-new flavors, Smoky and Spicy. Momofuku describes the Smoky version as "BBQ meets Korean chilies," which sounds like the best choice out of the three for grilled meats. As for the Spicy variety, you can use it to add some heat to "everything from fried chicken to tacos to egg sandwiches," according to a press release. It's worth noting, however, that the original Ssäm Sauce recipe packs a decent kick. If you want to try Ssäm Sauce, but don't know where to start, throwing some of the original on pizza or a fried chicken sandwich is your best bet. In fact, Ssäm Sauce on fried chicken is essentially the premise of Chang's Fuku chicken sandwich chain. Of course, it remains to be seen if people end up putting Ssäm Sauce on everything, but it's worth noting that Korean flavors are increasingly popular in American cooking, according to Sergio Eleuterio of Kraft Heinz's Springboard Brands. Korean food also had a moment during the 2018 Winter Olympics in PyeongChang, South Korea, and in Pinterest's top trends for 2018, the social media platform said saves for "Korean condiments" such as Gochujang sauces are up 222%. With that said, you might as well go ahead and make some room on your fridge door after all. Tony Merevick is Senior News Editor at Thrillist and David Chang approves of his use of Ssäm Sauce on leftover Sicilian pizza. Send news tips to news@thrillist.com and follow him on Twitter @tonymerevick.